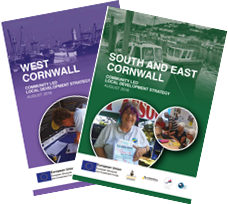 The Cornwall and Isles of Scilly Local Enterprise Partnership identified Community Lead Local Development (CLLD) as a multi-fund delivery mechanism for European Structural Funds in its European Structural and Investment Framework Document (ESIF). Furthermore the ESIF aspires to align CLLD with LEADER delivery (which is used to deliver elements of the European Agricultural Fund for Rural Development (EAFRD)) through the involvement of the same Local Action Groups (LAGs). During the ESIF development process four Local Action Groups were formed to cover all of Cornwall (West Cornwall, Coast to Coast, Atlantic and Moor and South and East Cornwall) and these groups led the engagement with the LEP about how CLLD and LEADER funding could be used to stimulate economic growth at local level. These groups successfully led the development process for LEADER funding and are now embarking on the delivery activity for those funds. In order to ensure complementarity, these groups are also leading the LDS development process for CLLD although it is recognised that within any identified LAG area the exact geographic coverage and activity of CLLD will differ from LEADER. This project will supports the necessary work needed to identify the exact coverage for CLLD within its overall LAG area and the economic issues that are prevalent within these areas that CLLD is best able to address. As such we will prioritise those areas identified as being within the 30% most deprived by reference to the 2010 Index of Multiple Deprivation (IMD). This project is designed to secure preparatory funding to enable the development of a Community Led Local Development (CLLD) Local Development Strategy (LDS) for ERDF for the most deprived communities in our area. This preparatory phase will support the engagement and training of local stakeholders; support the costs of targeted consultation activity; studies and evidence gathering and related administrative costs. At the end of this phase a fully evidenced based LDS for CLLD (ERDF/ESF) will be submitted to the Managing Authorities, the CLLD LAG will be established and the Accountable Body for the Delivery phase will be identified. This project is part-funded by the European Regional Development Fund and the European Social Fund.